The Hazardous Realm - Forum • View topic - Quest Error: Help Appreciated. Hi everyone. I just recently discovered DBTS, when I purchased a copy - As well as LfL - I found at a garage sale down the street. The game was unopened in the box, plastic wrapper around it and everything and it looked nice when I opened it up and installed it, but when I played it, I had a few graphical glitches and the menu was really laggy. I simply assumed this was because the game was from - What? 1998? 99? And my Machine was simply a bit advanced for it. 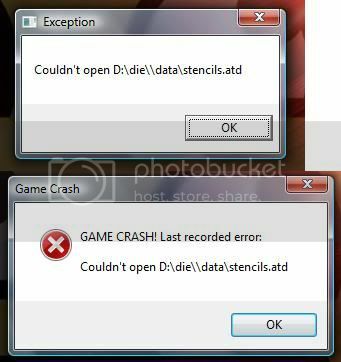 At first I suspected it may have something to do with the fact that the directory in the error message says 'die\\data..' instead of 'die\data..'. Now, I'm not so sure. I have seen one other person on this entire forum that has reported an error even similar to mine, so I'm assuming it's not really common. And if it isn't common, that must mean it's something specific to my game, and not a coding error in the latest version of the Xtended mod. That's why I'm not so sure it has anything to do with the directory having a typo in it. I would really appreciate some help here because I would love to play this game. Arena is fun and all, but I'd really like to play the Quests.. And I don't even know what tournament is! So help me experience this awesome game and give me your thoughts on what I should do about this error. Re: Quest Error: Help Appreciated. The problem might be that Xtended expects all data to be on disk (like it is with the GOG version), while the default installation from CD doesn't copy everything to disk. - Now insert the LFL CD and again copy the content of the "die" subfolder, overwriting existing files. I guess this might help. I just tried following the to-do list you provided me with, checking everything off, making sure everything copied over correctly. I followed the instructions to the letter, just so we're clear on that. It doesn't appear to have worked though. I still get the same error when trying to start the DBTS quest. I didn't test Tournament mode or the LfL Quest, as all three errors must be caused by the same problem, so if one of them isn't fixed, I don't think the others are. So solution nr. 1: Didn't work. Okay, thats strange. Do you have the english version of the game, or some other language? I am running the English Version of the game, yes. 1) Does it help if you replace your stencils.atd with this one? 2) Which version of Windows do you use? 3) Do you run the game with a user account that has administrative rights (is able to install things and stuff like that)? 4) With Windows Vista or Windows 7: Try to right-click the xLauncher.exe and select "Run as Administrator". Replacing the file didn't help. I am running Windows Vista SP 1. My account is the only one on the laptop, so I should think I have administrative rights. Running as Admin was something I had already tried. Everyone always suggests doing that, but I find It rarely fixes anything. This case was not an exception. For some reason, the game is still giving me the exception error. I still haven't gotten this fixed :S Any help at all is appreciated. Oh sorry, i forgot about that. I did some adjustments in Xtended in the hopes that it might help in this situation. Try to download and install DBTS Xtended again. - Enter "regedit" into the command prompt at the bottom of your start menu and press enter. The Registry Editor should start now. - It should contain two folders named "1.0" and "1.1". Both contain a "DestPath" and "SrcPath" value each. If any of those 4 path entries has a "\" at the end edit the entry and remove the "\". - Now try to run the game again. Did one of those things help?